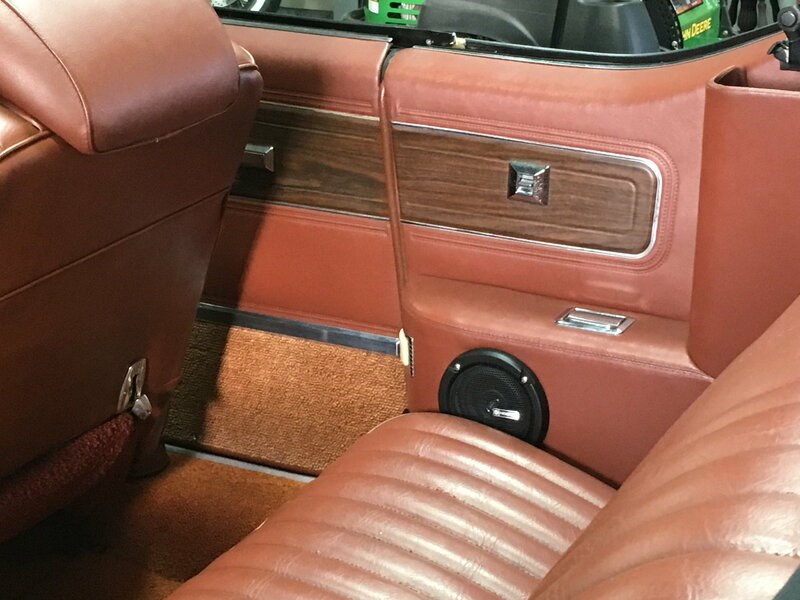 Does anyone know of a decent subwoofer that actually fits under the passenger seat of a 68 cutlass convertible? Thanks. Just one alternative thought that worked for me. I hung a "Bazooka Tube"(or equivalent, 8" IIRC)from my trunk torsion springs. Works great, excellent bass, stays out of the way. Might need something to limit side sway, either a bumper and/or strap if it is biased to one side. Mine is to the right as I have fairly large Alpine 5 channel amp on left side of floor "kick up." The only time I have heard it swing far enough to thump is doing a quick, dry burnout @ track and that's only once every year or two, doesn't hurt anything. Been in there for over a dozen+ years. You will be very limited on what will fit under the seat but I remember seeing an ad for such a unit. Another alternative is a sub that sits in your spare tire. 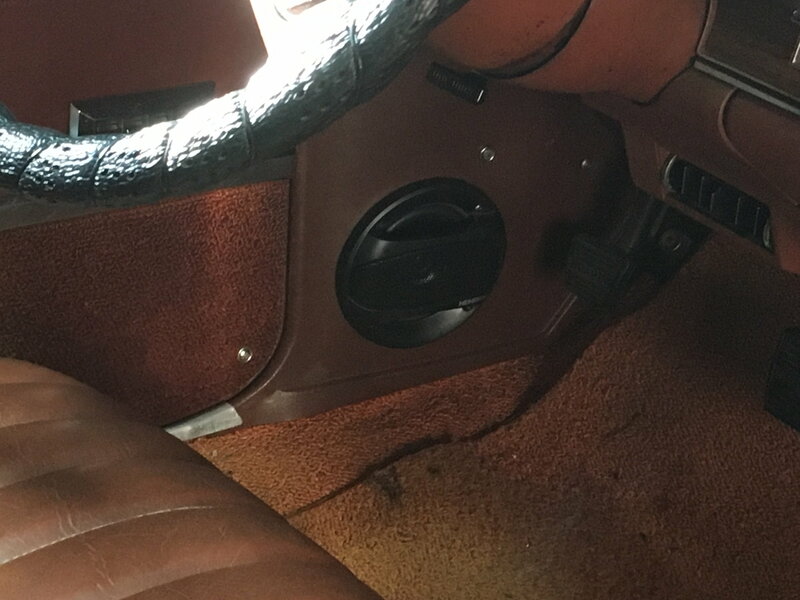 You also might be able to conjure up something behind rear seat where the roof pump is. Problem is a decent sub is generally not very compact. Last edited by bccan; January 1st, 2017 at 07:30 PM. Depends on the seats. On my bucket seats, the space between the steel frame pieces is only 8 3/8". Rockville makes an 8 inch sub (SS8P) that is 8.3 inches wide, so it might fit. But the connectors and controls are on the side (versus the end) so they may not fit. I decided to not try. Everything else I looked at was too wide - and I looked at a lot. 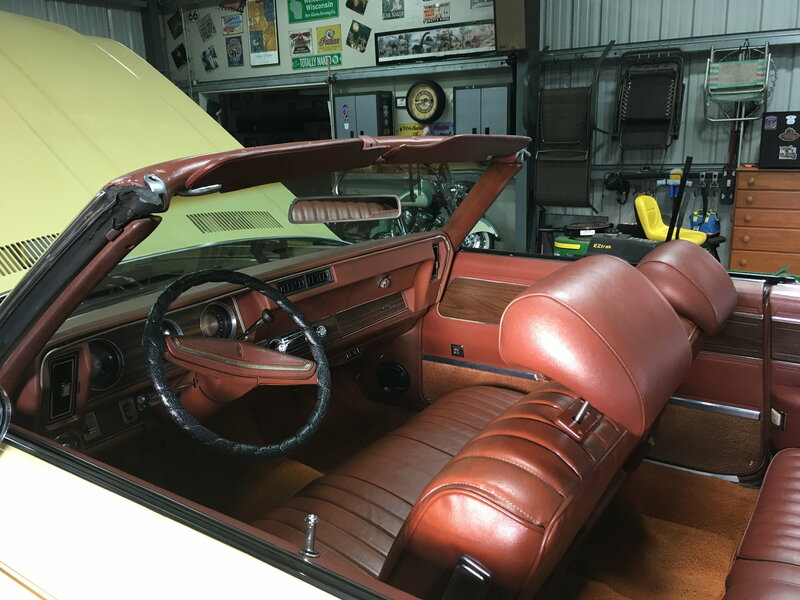 If you have a bench seat, you might be able to get a 10 inch Rockville under it - or maybe even 2 of them. I wound up putting an 8 inch Bazooka 250W in the trunk on the left side. Just fit. Pics of the Bazooka going in. Made a mount using a 2x4 bolted to the floor of trunk to raise it up - otherwise it hits the sloped section. Bass bounces off the rear of the trunk and goes forward. Are you one of those BOOOM BOOOOM BZZZZZ BZZZZ BZZZZZ guys that has awesome bass, even outside the car, yet your license plate rattles? I've got no problem with epic bass, but when someone is sitting near me with it, and parts of their car are rattling and sounding horrible, it ruins it. People need to listen to their system outside of the car, too, to make sure it doesn't sound stupid. ^^This^^ -I hate it when some gang banger rolls up next to me at a stop light and his whole car is rattling louder than the engine! Keep in mind that it is difficult to get accurate bass response from the trunk of a convertible but it can be done. Most of it will disappear out the rear at highway speeds with the top down though so don't be disappointed. A pair of those Bazooka Tubes, one on each side, mounted facing the rear will be the easiest. Since bass is non-directional, mounting the speakers facing the rear has nothing to do with "bouncing" forward. It has to do with increasing the sound pressure. Think putting your thumb over the end of a water hose. Before permanently mounting the tubes move them forward and back from the rear of the vehicle to find the sweet spot. Gang-Bangin' got nuthin to do with rattling a car. As a 15 year veteran of the '80s and '90s stereo wars I can tell you that rattles come from all walks of life. But yeah, take care of them rattles! I wanted to show that the 8 inch Bazooka will fit in the space. There is just enough room at the front and rear of the tube to put a small rubber bumper. It doesn't stick out past the lip of the trunk opening, so there is room in the trunk for plenty of luggage. I attached some pics showing the clearance. This is with the tube mounted 3 1/2 inches above the trunk floor on a 2 x 4. When I inherited my car, it had a power amp and CD changer where the Bazooka is now and a giant subwoofer box that took up half the trunk space. Even worse, I could not really hear it with the top down while driving. 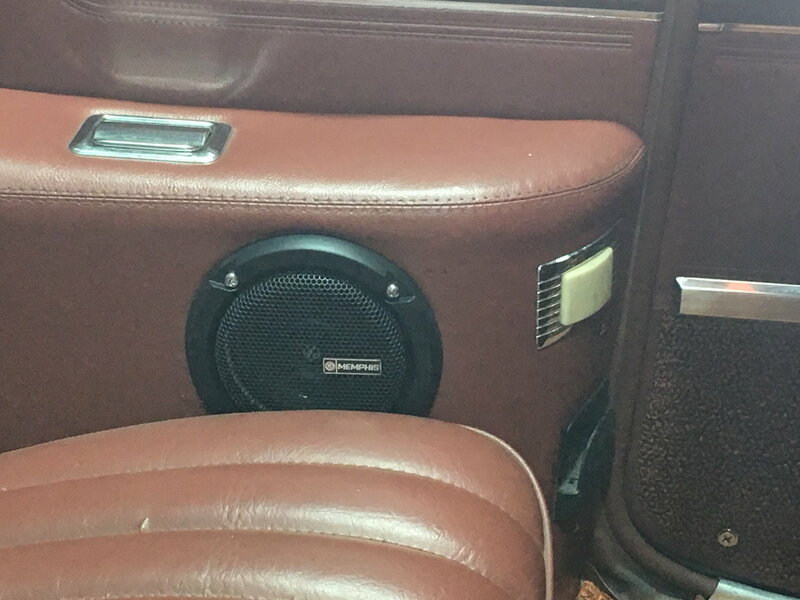 The 8 inch 250W is loud enough to hear with the top down while driving, but not by much. Good enough for me. It does have an amplified output for a second 8 inch that you could mount on the opposite side of the trunk. This is a passive 8 inch that only cost about $100 and will double the bass if find you need that. If you have a powered antenna on the right side it will be in the way. 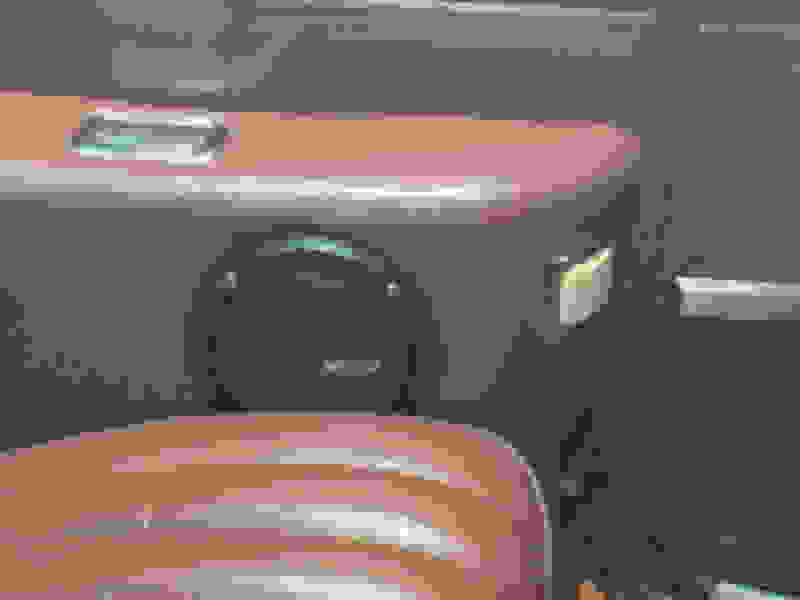 I should add that the Bazooka website has info on positioning in the trunk, getting better bass, getting the bass from the trunk to the passenger compartment, etc. that is worth reading. When I bought my car it had a CD changer, amps, capacitor, lots of plywood, and a giant box with 2 12" subs firing up all in the trunk. In the passenger compartment were 8 speakers. It did not sound good. 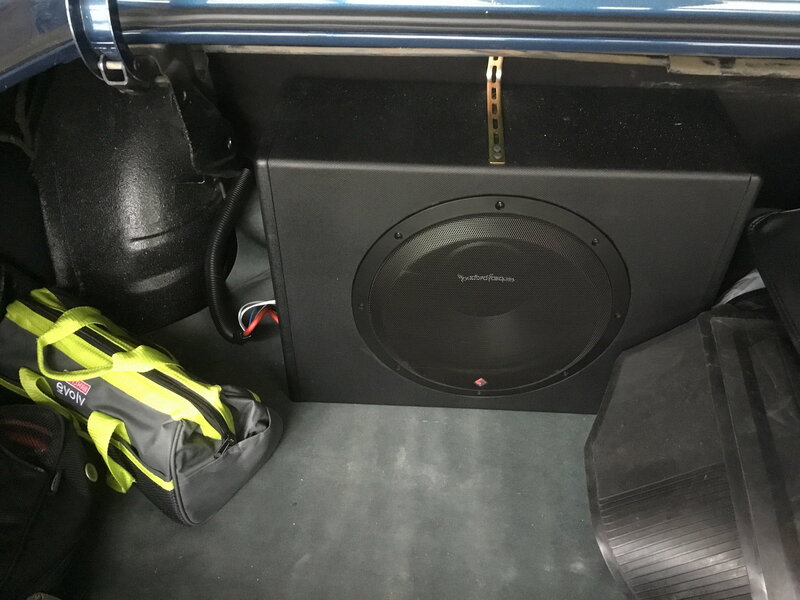 I ripped it all out (150Lbs), and replaced it with 4 speakers in the passenger compartment, and a small amp with 2 6.5" subs hung between the trunk springs firing forward. It sounds reasonably good. All in it is about 25Lbs of stuff and leaves the trunk useable. If you have a convertible, finding space is a tall order. In the rear, the top hydraulic rams take up a good deal of space (and they rotate as they operate). I spent considerable time finding space, finding the appropriate sized decent speakers & fabricating my installation. If you have questions, ask. Ha!!! a sub that looks like a NOS bottle. That is killer. Like Vintage Chief, mine are in the front kick panels & rear side panels. The previous owner already had them in those locations (and others), so I kept those 4 locations. My personal experience says otherwise. I have dual 8's mounted in a box in the trunk. I can drown out any and every road noise etc, even with the top down on the freeway, plenty of "bump"
Most of the low frequency information from a sub-woofer is felt, not heard. These "bass shakers" will use the floor of the car to transmit the low frequencies so you can feel them. Parts-Express has them on sale right now for $40 ea. They handle 50w each at 4Ω and you can wire them in series-parallel for more power handling; two of them will handle [email protected]Ω or four of them will handle [email protected]Ω. They work best crossed over at 100 Hz or lower.